The 6-17-23 back in 2014 and selling out quick. With the Retro 1 KO and Retro 6 Carmine coming soon, we’ve found a best of both worlds deal. The 6-17-23 Carmine is in stock and on sale now. 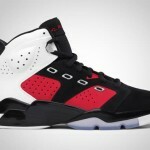 The 6-17-23 Carmine originally release in January 2011, theres a few sizes left and on sale. GS sizes are $89 and Mens $119. Cop them now at pys and get free shipping.